Maybe you waited until the last minute to find your Halloween costume. Maybe you’re Megan Kelly and are in need a non-problematic disguise. Either way, these instantly iconic Halloween lewks, worn by V favorites from Gigi Hadid to Emily Ratajkowski, are worth a revisit. Because around here, Halloween is about being whoever you want to V.
Wet plate collodion photographer Ian Ruhter has made a name for himself by pushing the boundaries of the medium. For his latest endeavor, Ruhter turned a 200-pound sheet of glass into the world’s largest wet plate collodion photo. The photographer and his team visited a forgotten town called Bombay Beach, located on the edge of the Salton Sea in California’s Imperial Valley. There, they found an abandoned house and got to work turning it into a giant camera for a giant wet plate collodion photo. “Instead of focusing on the decay from the outside, this house camera allowed a view from the inside into someone’s dream,” Ruhter says. He placed a giant lens over a hole in a wooden board on the front of the house, and the outside world was projected onto a plane inside the darkened room. Ruhter’s subject for the largest photo was Ted, a 100-year-old resident of the town that recently became homeless. “Images of Ted […] were projected in, breathing new life into this abandoned structure and once again making it a home,” Ruhter says. “During this brief moment in time when Ted’s photograph was captured, he was present in both places. The portrait was captured on a 66×90-inch (5.5×7.5ft/1.68×2.29m), 200-pound sheet of glass coated with collodion. The resulting Ambrotype photo is now the world’s largest wet plate collodion photo. You can find more of Ruhter’s work on his website and Instagram. About the author: Trent Siggard is a first-person view drone pilot. The opinions expressed in this article are solely those of the author. Siggard helped establish Dronefly and currently works for Yuneec in Kunshan, China. You can find more of his work on his website, Facebook, Twitter, Vimeo, and Instagram. This article was also published here. In this article, we are going to be talking about 3 different ways you can set the right exposure for film. The biggest thing for beginning film photographers is to learn is how to meter your film properly. For our example today, I’m going to be shooting on Portra 400 and Fuji 400, and the Portra 800. These are 3 methods I’ve learned over the years about how to properly set your meter, from doing it without any equipment to using a handheld light meter, which I recommend as the best way. The tried and true method for getting the right exposure for film cameras that started when film was invented. They used to print it on the back of a lot of cameras on a plaque, so you could look at it and figure out what your exposure should be. This rule is based on the fact that the sun is always f/16. If you have a 400 film stock, set your shutter to 400, and your aperture to f/16 and it’ll give you the correct exposure. If you are going to compensate, give it a little bit more exposure. f/16 in the sun, f11 overcast, f/8 if it’s more overcast, f/6 is heavy overcast, f/4 in the shade. This is not meant to be an exact form of metering, it’s meant to estimate if you don’t have the equipment. Let’s take a look at how I did with my Sunny 16 shots. So the first shot is in the open shade with f/4, it looks very good. I’m getting good detail in the whites. When I go into the direct sun, I get a lot more contrast and clarity in the image. The shade could have even used a stop or a half stop more. In the sun you get a lot more density with the image in f/16. The Sunny 16 rule worked perfectly with this exposure. I think this is could use another stop of exposure. I would have gone to f/6, but the photos are usable. I could correct them and make it work just fine. Great detail throughout, the sunny 16 worked really well here with great contrast and light in the image. The only thing that I missed with this rule was not giving it enough exposure for the medium shade shot. First, set the ISO at one half the box speed of your film. So if your film is 400, you set the camera to ISO 200. This makes it so that you are overexposing your film by one stop. Now you set the aperture you want, then find the shutter speed, then transfer the exact numbers to your film camera and shoot away! This is the best, safest way for your photos to come out look great with the correct exposure! By using an external light meter, you can take a reading of whatever is being picked up by the camera. I’ve got an old-fashioned light meter and the new Illuminati Light Meter, both are good for different reasons. The Sekonic Light Meter is an incident light meter that records the light that falls onto them directly, so they take an immediate reading. With this meter, you need to walk up directly to your subject and take a reading there pointed towards the camera. The reflective light meter records the light that bounces off your subject that’s why cameras have internal reflective light meters. With the Illuminati Light Meter (below), you can put your light meter on a stand and let it stay there while you continue shooting. First off, I’m going to aim this meter back at the subject aiming directly at the camera with the bulb in or out. If the bulb is in, it cuts your exposure in at over half at a stop, There isn’t any reason to do that, so I leave the bulb out. Now the Fuji 400 I would probably cut it one more stop. I would take my Fuji 400 and rate it at ISO 100. With the Portra 400, I’d set it at ISO 200. Let’s take a look at the shots in the studio! I started at with 1/500th at f/4, it gave me a normal reading. The Fuji 400 is popular film stock for many photographers, but I like the Portra 400 mainly because it gives a lot more contrast and color to the photo. You can see that in the Fuji 400 photo, the whites in her dress are blowing out with the normal exposure. Lots of people use the Portra 800 when shooting inside. This one has the same problems as the Fuji 400, in that with normal exposure I don’t get very good detail and contrast in the image. When I go to +1 EV , I get better detail. So there’s a look at 3 ways to meter to get the correct exposure and also some film tests to be able to see what kind of stock you might want to shoot with in the future. Remember: more exposure is better; less exposure, you’re in trouble. P.S. All of our film stock was processed and scanned by Richard Photo Lab. The New York-based artist Cheryl Donegan has long examined fashion and self-presentation in her work, so it’s fitting that she would catch the eye of Angela Missoni, who tapped Donegan for “Surface Conversion,” a series site-specific art installations at the luxury house’s Madison Avenue flagship. But unlike the byzantine knits that hang in the store, Donegan’s layered, collage-like works are often made using repurposed textiles and lo-fi digital techniques. Lexar has abandoned the XQD memory card format and is now focusing its attention on pushing for CFexpress as the future standard. After the Lexar memory card business was shut down by Micron in June 2017 then acquired by the Chinese company Longsys in September 2017, Lexar stated that it would continue producing XQD memory cards. Lexar says Sony and other companies were responsible for preventing progress. XQD was announced back in 2010 by SanDisk, Sony, and Nikon. CFexpress was announced by the CompactFlash Association in September 2016 as a direct successor to XQD — XQD-compatible cameras can be upgraded to support CFexpress with a firmware update. While XQD cards have top theoretical speeds of 1000 MB/s, CFexpress could reach ridiculous speeds of 7880 MB/s, or nearly 8 gigabytes of data per second. With this latest move, Lexar joins the young ProGrade Digital in rejecting the XQD format and pushing for a future of CFexpress dominance. When I read or watch reviews of lenses by folks in the photographic community, it often seems like one of the most important qualities to them is how the lens renders bokeh. It’s often made me wonder, do we sometimes forget that bokeh is just background? And is this fixation healthy? Or most importantly, how much does it matter to an average person who has never heard the term “bokeh”? To find out, I decided to do a bit of research. I took a bunch of photos in different circumstances with different subjects and at different apertures, but at consistent distances. I then created a survey which presented pairs of these photos, one shot wide open and the other shot at increasingly smaller apertures. To ensure participants didn’t begin fixating on the main difference between these images (the depth of field), I also filled the survey with other pairs of similar photos, so the differences seemed more random. For each pair of photos I asked participants, which of the two was better, and why. I didn’t qualify what “better” meant. I left it completely open-ended. Please watch the video above for more details, but, in short, I was interested in two things. First, which apertures did people prefer at consistent distances and in similar sorts of subjects? Or more precisely, at what point in the differences between apertures did people start to have strong opinions on particular photos being “better”? Second, at what point people started to use terms that related to bokeh and the background rendering in their reasoning. I’m not going to go through the specific photos and responses here (you can find those in the video), but the two things I learned was that it wasn’t until a difference of f/1.2 and f/2.8 (on an APS-C device with a 56mm lens) that respondents began talking about differences in the background. Before this, very few picked up on differences in background rendering. The second thing I learned was the degree to which non-photographers really don’t care about the background. Now, I fully expected that non-photographers would not fixate on the background as much as photographers might. But I was shocked at how little they regarded pronounced bokeh. Overwhelmingly, respondents preferred images taken at more narrow apertures over images shot wide open. Their reasoning ranged from appreciating more details and context in the environment to more sharpness in the image. 1. To non-photographers, the strength of a photograph is not measured in terms of its background blur. 2. The average person cannot really tell a difference between photos taken at a difference of one or two aperture stops, even when they are specifically looking for differences. 3. People might prefer a little bit more definition that an f2.8 or an f4 aperture might provide over a lens being shot wide open (at least at distances I tested). 4. We should be ultra concerned about protecting the sharpness of our subject from front to back. Bokeh can be helpful at times, but in most cases it is not more important than having a sharp, crisp subject. In short, keep your priorities straight. What is in focus is always more important than what is not in focus. About the author: Andrew Branch and his wife Denae are a husband and wife photography team based in Utah. The opinions expressed in this article are solely those of the author. You can find more of the Branch’s videos on YouTube. Are You Colorblind, and How Good is Your Color Vision? In this article, we’re going to briefly look at the subjectivity of color. This is a colossal subject, but I wanted to share some of my thoughts on how color is perceived by each of us and whether it’s really that important. First off, color is subjective. I don’t care what else you believe in, but that is an indisputable fact. You perceive the red of an apple differently than I do, and we will never know by how much — ever. More importantly, though, neither of us are right or wrong, as there is no way on knowing the actual exact color of that apple. Colour only has any relevance when we try and describe it to somebody else, and the accuracy of that information is rarely crucial. When I ask you for a red apple and not a green one, you aren’t going to ask exactly how red I want my apple to be. Of course, there are situations in which color is life-threateningly crucial. Pilots, coastguards, electricians, bomb disposal experts, and many other careers need to know the subtle variances of color, but ultimately most of us needn’t worry too much about what colors we’re actually seeing. But What if You’re Colourblind? The reason I’m prefacing this article with the subjectivity of color is because I hear photographers being concerned that they can’t accurately determine color casts correctly and that they may be colorblind. Let me be clear, there is a vast difference between being colorblind and not being able to determine subtle variances in color where photography is concerned. First off, color blindness is genetic (hereditary) and as such you were born with it. You can’t catch it, nor can you ‘fix’ it. Chances are though, even if you are colorblind, you’re managing just fine. I am also almost entirely sure that when you did discover you were colorblind, that it was somebody else who ‘told’ you that you were. Up until that point you were likely, and rightly unaware of it. Remember, color is subjective and I will only know what one color looks like to me and you will only know what one color looks like to you. It’s nearly always somebody else telling you that you’re seeing colors‘ wrong’. Note: If you’d like to check if you’re colorblind, I have included a list below of useful online visual tools to determine your abilities to spot variances in color. How Does Colorblindness Affect Us as Creatives? So now that we’ve determined that it really doesn’t matter if you’re colorblind or not, let’s look at how our ability to read colors affects us as photographers. As I said, if you’re colorblind it’s not the end of the world for artists — in fact, it’s often quite the opposite. Look at the work of famous directors like Christopher Nolan and Nicolas Winding Refn. They are both colorblind movie directors working at the top of their game with little to no negative implications of their color blindness. Drive, a movie directed by Nicolas Winding Refn is one of the most visually powerful films in recent history. Nicolas Winding Refn use outstanding colour palettes to tell his story. Neon Demon, another film by Nicolas Winding Refn and arguably a movie that uses extremes of colour to set mood and imply intrigue. The Dark Knight directed by Christopher Nolan is one of the biggest films ever made. That success is in part due to the incredible cinematic use of colour within the darkness of this movie predominantly set in the dead of night. So whether you’re colorblind or not, don’t let it hold you back but more importantly don’t let anybody else tell you it’s a hindrance or that you can’t be a good photographer or any other artist for that matter. Okay, so this is really where a lot of us sit. We’re not colorblind, but we struggle with spotting subtle differences in color. These color differences I’m referring to are specifically related to photography and they crop up when we’re trying to correct white balance issues or trying to color grade a shot. Here’s the good/bad news; color acuity is a skill. It can be learned, but it will take time. This skill is like any other and 20 years ago, I was terrible at it and now I am a lot better at it. Back then, before digital, we would have to color print using negative enlargers and chemicals. We would have to dial in our color corrections by hand via the magenta, yellow and cyan dials on our enlargers. We would have to also know that we can create any color correction via these three dials because by removing magenta we get green, by removing yellow we get blue and by removing cyan we get red. I was not great at it and that’s because it takes time to develop the eye skill to determine color casts present in your shot. Anybody can color print correctly if they know what colors to try and balance, the skill isn’t in operating the machine but in knowing what needs to be adjusted. Let’s take a look at a couple of examples below to try and see what I mean. The above image may look okay to some of you and in all honesty, this would have looked perfect to me too 20 years ago. But experience tells me that there are a few concerning color factors present in this shot. The shadows are looking a little sickly with a slight cyan/green tinge and the highlights are a little yellow. Let’s dial in some corrections and see if we can get closer to something the looks more desirable. With the color adjustments made, I’m feeling a lot happier about the overall shot and the skin tones now visually look more appealing. Some of you may actually prefer the previous version, and that’s totally fine too. More importantly though, at no point did I say I was trying to make this look accurate or perfect. I personally believe that’s a fool errand, as making it look perfectly accurate is technically impossible. Remember I said at the start that we all see color differently and that color is subjective? Well, how on earth are we supposed to accurately color correct something if we all see something slightly different? Don’t get me wrong, I’m not saying color correction isn’t important but I am saying that you need to develop a personal eye and taste for it and that will only develop over time. Look at the colors in your images from years ago, are they perfect? Chances are that you’d color them differently now. Spotting variance in color is a skill like any other. I get asked by my wife all the time to taste-test dinner whilst it’s bubbling on the stove. I taste the food and to me, it either tastes good or it doesn’t. I have absolutely no clue what to add if it doesn’t taste good though, but some of you will likely think I’m mad. Surely you know if it needs more salt, wine, sugar etc?! To you that may be obvious and to me, coloring is the same, it’s obvious but only because I have a lot of experience with it and I’ve trained my eyes to spot very minor differences in color. So with all this in mind, let’s try to drop the word ‘correction’ from ‘color correction’. There is no ‘correct’ color, so stop worrying your monitor has shifted a degree one way or another, instead start paying attention to color with your own eyes rather than relying on what a machine tells you is right and wrong. Of course, color blindness is a real thing and it’s very important to a lot of us. Chances are though, if you’re smart enough to be reading this post then you likely already know if you’re colorblind or not. But if you’d like to double check, here are a few tests to put your eyeballs through their paces. 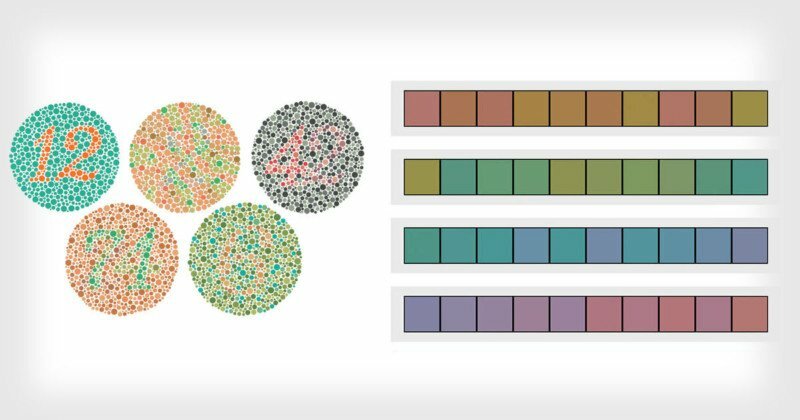 The Ishihara color blindness test is the most famous and it’s the one with the all the colored dots and numbers. There are plenty online and most are fairly simple for a wide range of color variances in eyes. The link I’m providing here though takes you to a fairly complex version that has a lot more nuance in color. You’ll get a score at the end too. Remember though, color blindness is far more common than you think. 1 in 255 women and 1 in 12 men have some form of color vision deficiency so don’t be alarmed if you don’t get a perfect score. Here’s a link for taking this test. So now that you’ve taken the Ishihara color blindness test and you’re confident you know your colors, here’s the far harder Farnsworth-Munsell hue test. This test actually gets you to rearrange hues on a chart from one color to another. This is an excellent tool for us photographers because it forces us to spot very minor and subtle changes in color hues. It’s now finally time to leave the kiddie slopes and test both your patience and your eyeballs on this last hue test. This time we’ll be rearranging nearly 100 hues across four color strips. Once you’re done, hit the ‘score test’ button to see your results. Like I said before, color is subjective and even if you are colorblind, don’t let that stop you from being a phenomenal artist or photographer. And if you’re not colorblind but still struggle with spotting variances in colors, don’t worry, it will get easier with time and experience. For example, I passed all of those three tests with a perfect score, but I guarantee you I wouldn’t have even come close to that 20 years ago. About the author: Jake Hicks is an editorial and fashion photographer based in Reading, UK. He specializes in keeping the skill in the camera and not just on the screen. If you’d like to learn more about his incredibly popular gelled lighting and post-pro techniques, visit this link for more info. You can find more of his work and writing on his website, Facebook, 500px, Instagram, Twitter, and Flickr. This article was also published here. Last night, the Boy’s Club New York hosted the 70th Annual Fall Dance at The Plaza Hotel, an evening filled with some of Hollywood’s brightest young talents, some of who fit perfectly in the Ferragamo family. Arriving in Paul Andrew’s debut AW18 collection, notable guests in attendance included Larsen Thompson, Dylan Sprouse, Sofia and Marina Testino, Emily Robinson, Diggy Simmons, Emily Meade, Clara McGregor, among others. If you’ve been wanting to learn more about the subject of camera color science, here’s a solid 13-minute video by Gerald Undone that will bring you up to speed on the subject. The video “is all about color science in cameras: why pretty doesn’t mean accurate, what makes Canon’s colors unique, and if it should affect your gear decisions,” Gerald says. 00:56: What Is Color Science? 05:19: What Is a Color Matrix & How Do You Change It? 07:12: But This Is All Subjective! 09:22: Practical Applications & What about Raw Video? 10:21: Does Camera Color Science Matter for Log Recordings? “What exactly are we doing when we talking about liking the ‘color science’ of a camera?” Gerald says. “Honestly, I think we’re only doing two things here: one, desperately trying to find something positive to say about a brand that we inexplicably love by expressing abstract ideas in the fact of an obvious lack of technical innovation, or two, promoting how little effort on your part is required to render an image that you find subjectively pleasing. You can find more of Gerald’s videos by subscribing to his YouTube channel.